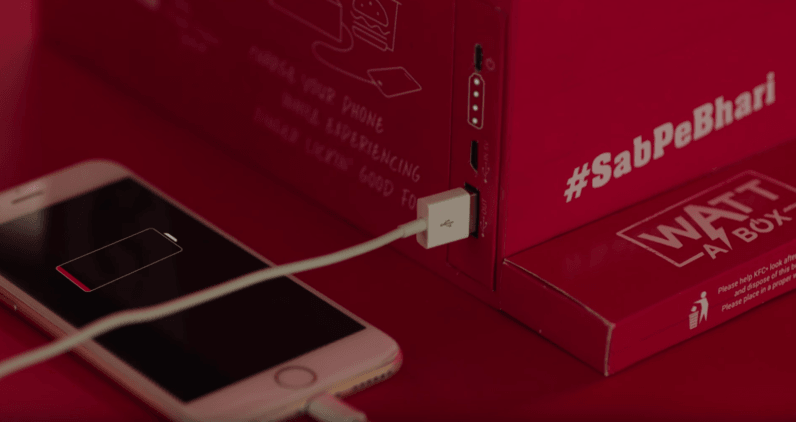 If you needed further proof that we are indeed living in the future, KFC has just introduced a box for its 5-in-1 meal that features USB, micro-USB and Lightning connections — and even includes the cables — to charge your mobile devices. Currently, the box is only available in Mumbai, and they aren’t given to every customer. Instead, the ‘Watt a Box’ is handed out at random to customers ordering the 5-in-1 meal or by entering a contest at KFC India’s Facebook page. If you are one of the lucky winners of a Watt a Box, you’ll not only get some some truly unhealthy (but simply amazing) grub, but a 6,100mAh battery with all the connections — and cables — you’ll need to charge your favorite device. It’s also removable, so if you’d rather leave your grease bucket at the location you picked it up, but take the battery on the road, you can. A word of warning though, BGR put an iPhone 5s to the test with the battery pack and gained 17 percent after half-an-hour. Not terrible, until you factor in that the battery bank was completely drained during that time. After recharging it to 100 percent, they attempted to charge a Redmi Note 3, but only managed to get 7 percent before the battery died again. So, as unlikely as it may seem, the best portable battery banks probably aren’t coming in KFC containers. But, that doesn’t make the promotion any less cool.